All documentation points to Gem using this Casino almost exclusively while in Heavy Stereo. It has a large peace sign on the back (to avoid buckle rash). He later used this during the 1999 Oasis shows (which I had the pleasure of being front row for his first show ever with Oasis in Philadelphia), and during the Standing on the Shoulder of Giants tour. Picture courtesy of Mick Mercer from 1995. Used when he played in the band Whirlpool. Picture taken in 1991 by legendary author Mick Mercer. Used while in the band The Contenders. 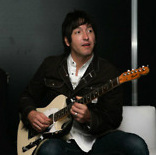 Pick up a copy of Mick Mercer's book Gem Archer to find pictures of Gem wearing a white, one-piece jump-suit! Photo by Mick Mercer from 1988. 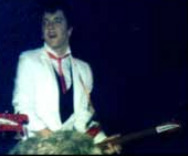 Gem played this 1970s, 3-bolt American Stratocaster in 1986 while playing with The Edge. 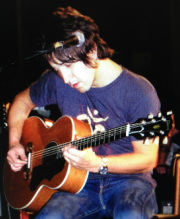 This is the oldest known picture of Gem with a guitar. 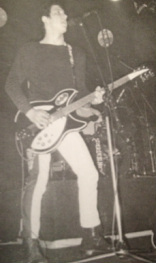 I believe this is the Rickenbacker 325 he said he and his late uncle picked up together. Definitely a piece of history! 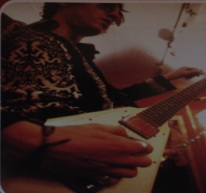 Gem is seen on the cover of both a Heavy Stereo single and the cover of their debut record using this white Flying V. It is unclear if this was just a guitar he used for the pictures or if it was in fact used on any recordings. Most Flying V's come with uncovered pickups, so these have either been replaced at some point, or they are Gibson 57 Humbuckers that were at one point offered stock in the Flying V. It definitely keeps with the "indie does glam" sound and look the band originally went for. Also kept in Gem's guitar rack during the 2005 US tour, but never played. Used during radio performances for the Don't Believe the Truth tour. 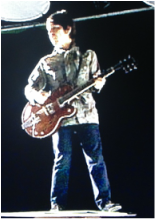 I believe this is the guitar Noel bought and played during "I am the Walrus" on Oasis's 2009 tour. 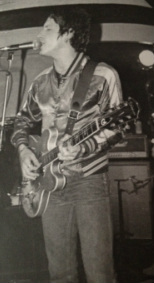 It could possibly be Paul Weller's 1968 SG. 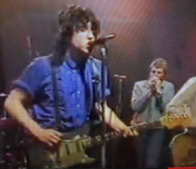 Gem is seen here playing it live with Paul Weller. Gem played this during radio sessions to promote Dig Out Your Soul. 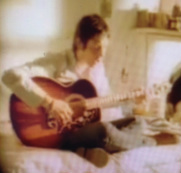 This guitar is possibly the same as the Trini Lopez Andy Bell uses on Beady Eye tours, although a Trini or two has been seen kicking around the Oasis camp since 2000. Used during the Paul Weller acoustic tour and also used for "Tomorrow Never Knows" when Gem joined Johnny Marr and Noel Gallagher for a Lennon tribute. Seen on TV when he and Paul played "Going Places." This is the Telecaster Noel claims he routed for humbuckers on his own. Noel has been seen playing this Tele quite a bit. It has a Dallas Cowboys star on the pickguard. Used during the making of Dig Out Your Soul. 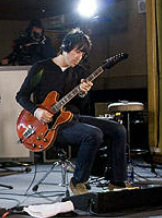 Gem used Steve Cradock's ES-335 when he joined Paul Weller onstage in 2010.